Nasturtium Hortense.--Every one knows this plant. It warms and strengthens the stomach. It is good for the scurvy, being a great purifier of the blood. The seeds open obstructions. Black Cress (Nasturtium Niger) has long leaves, deeply cut and jagged on both sides, not much unlike wild mustard; the stalks small, very limber, though very tough; you may twist them round as you may a willow before they break. The flowers are very small and yellow, after which come small pods, containing the seed. It usually grows by the way sides, and sometimes upon mud walls, but most among stones and rubbish. It is a plant of a hot and biting nature. The seed of Black Cress strengthens the brain, and in that respect is little inferior to mustard-seed. It is good to stay rheums, which fall from the head upon the lungs. Beat the seed into powder, and make it into an electuary with honey; and you will have an excellent remedy for coughs, yellow jaundice, and sciatica. The herb boiled into a poultice, is an excellent remedy for inflammations, both in women's breasts and men's testicles. Nasturtium Silvestre. These also are of two kinds. The first rises up with a round stalk, about two feet high, spread into several branches, whose lower leaves are larger than the upper, yet all indented on the edges, like gar�den cress, but smaller; the flowers are small and white, at the tops of branches, which produce small brownish seeds, very sharp in taste, more so than garden cress; the root is long, white, and woody. The other bath the lower leaves whole, rather long and broad, deeply dented about the edges towards the ends; but those that grow up higher are less. The flowers and seeds are like the former, and so is the root, and both root and seed are as sharp as it. They grow by the waysides in untilled places, and by the sides of old walls. They flower in the end of June, and their seed is ripe in July. The leaves, but especially the root taken fresh in Summer-time, and made into a poultice or salve with lard, and applied to the places pained with the sciatica, for four or five hours, the place afterwards to be bathed with wine and oil mixed, and then wrapped with wool or skins after they have sweat a little, will assuredly cure not only the same disease in the hips, or other joints, as gout in the hands or feet, but all other old diseases of the head, (as inveterate rheums,) and other parts of the body that are difficult to be cured. Re�peat in five or six days. It is also effectual in diseases of the spleen; applied to the skin, it taketh away blemishes, whether they be scars, leprosy, or scabs. It may ulcerate the part, yet that is to be healed with a salve made of oil and wax. THE CANDY-TUFT, Iberis Amara, is of the same nature. Flowers, different colours. The leaves are used, and give relief in sciatica, or hip-gout. The best way is to beat them with a little lard. It is a good remedy, and ought to be more in use. 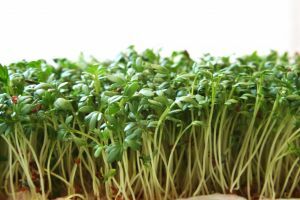 CRESS,�WATER CRESS. Nasturtium Aquaticum.This is well-known. They are more powerful against the scurvy, and to cleanse the blood and humours, than Brooklime, (which see.) It removes the stone, and is very diuretic. It removes female obstructions. The decoction cleanseth ulcers, by washing them therewith. The leaves bruised, or the juice, is good to be applied to the face, or other parts troubled with freckles, pimples, spots, or the like, at night, and washed away in the morning. The juice mixed with vinegar, and the fore part of the head bathed therewith, is very good for those that are dull and drowsy, or have the lethargy. One ought to venture on more than a drop at first. In obstinate costiveness, in dropsy, in apoplexy, and paralysis, this oil is generally used. In lock-jaw, and mania, it is of great advantage, a drop or two placed on the tongue will be sufficient. Externally applied it is a valuable counter-irritant; soon producing eruption, and therefore is a special remedy for inflammation of the chest.